In May, we introduced Gboard, a new iPhone app that lets you search and send information, GIFs, emojis and more, right from your keyboard. Today, Gboard is going global with international availability, and we’re adding smart GIF suggestions and a way to personalize keyboards. 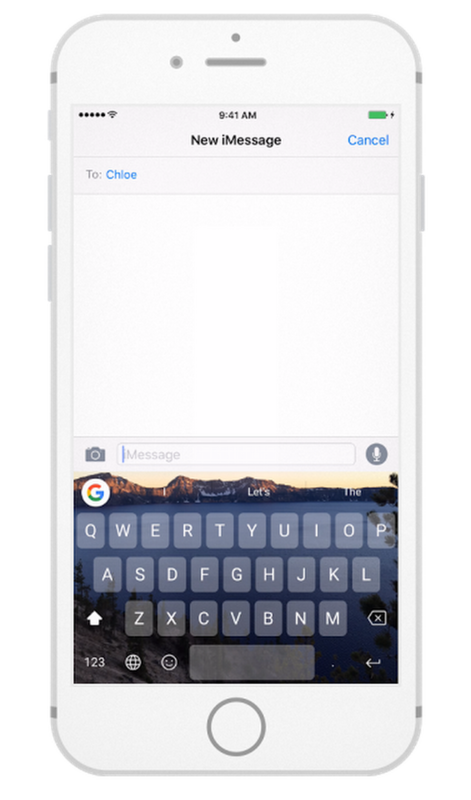 Gboard is already available in English across the U.S., Europe, Canada and Australia. Starting today, Gboard is ready to start sending GIFs, searches, emojis and more for our friends who speak French, German, Italian, Portuguese (Brazil and Portugal) and Spanish (Spain). Gboard will default to your device language, so as long as it's set to one of these six languages you're good to go. If your phone uses a different language, Gboard will default to U.S. English. You can change the language in your Gboard settings. Joining text, search and emoji suggestions, you’ll now see GIF suggestions too. Say you’ve got a reason to celebrate so you text your friend “let’s party!” — now, you’ll see a suggestion to search for relevant party GIFs with one tap. Whether you like a keyboard that blends into the background or shows your personal style, today’s update is for you. For those who like a more low-key style, in addition to the current light keyboard, we’re adding a dark keyboard so that Gboard can blend in with darker apps. We’re also introducing the ability to select a personal image from your camera roll to show behind your keyboard, so you’ll never be without your favorite picture from that trip to Crater Lake. We hope our new friends around the globe love sharing GIFs, emojis and searching as much as we do. To try Gboard, go to the U.S. app store or to your local app store and try any of our six languages, with more coming soon.